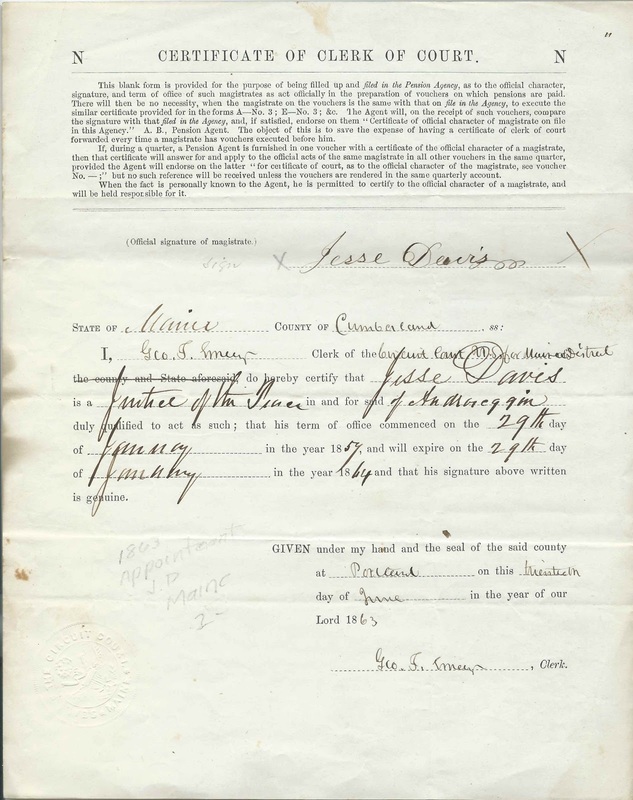 June 20, 1863 document signed by George F. Emery, Clerk of the Circuit Court for the Maine District, at Cumberland County, Maine, to certify that Jesse Davis was then a Justice of the Peace for Androscoggin County, Maine, in the midst of a term from January 29, 1857 to January 29, 1864. The document measures a bit over 10" by 8"; nothing appears on the reverse. 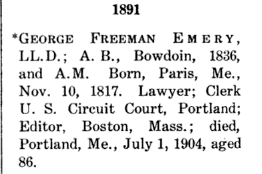 George F. Emery was George Freeman Emery, LL.D, A.B., who was born at Paris, Maine, on November 10, 1817, son of Stephen Albert Emery and his first wife Sarah (Stowell) Emery. It's interesting to note that George's sister was the first wife of Hannibal Hamlin, Lincoln's first Vice President; after Sarah's death, Hamlin married George's half-sister Ellen Vesta Emery. On August 21, 1841 at Portland, Maine, George Freeman Emery married Abby Eliza Appleton, daughter of John White Appleton and Sophia (Williams) Appleton. George died on July 1, 1904 at Portland, Maine, and is buried there in Evergreen Cemetery. I wonder if Jesse Davis was this Jesse Davis from the Webster section of Sabattus, Maine, born July 21, 1814, whose Find a Grave memorial notes that he was was a selectman of Webster, a Senator in the 51st Legislature of Maine, Lisbon's town treasurer, Justice of the Peace, Captain in the Maine Militia and founder of the Manufacturer's Bank of Lewiston. This Jesse Davis married Mary Ann Woodbury/Woodberry. If you have a different take on the identifies of George F. Emery and Jesse Davis, please leave a comment or contact me directly.